Are you confused about which Google Drive software tools you should install on your Windows PC or Mac desktop for use with your G Suite for Business account versus your personal @gmail.com account? If so, this first in a series of blog posts is for you. Working with files purely in the cloud like Google Sheets, and Google Docs is the ideal way to go, but often we need to work with more traditional files stored on our desktop computer like photos, Microsoft Word/Excel, and accounting data like Quickbooks. Backup and Sync is an app for Mac and Windows PC's that backs up files and photos safely in Google Drive and Google Photos, so they're no longer trapped on your computer and other devices. Backup and Sync works for both Google Photos and Google Drive. 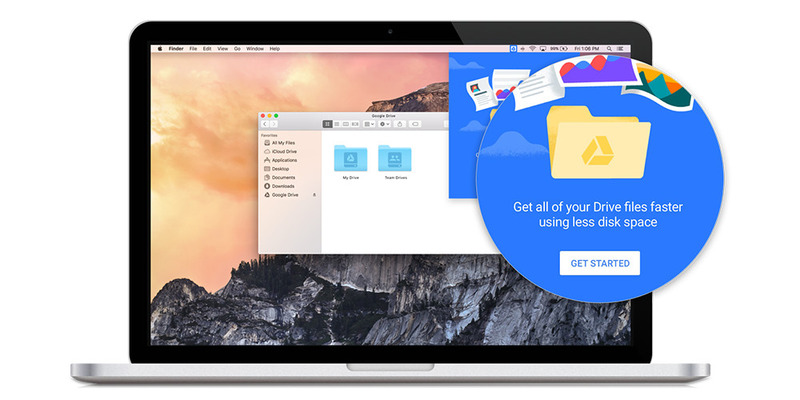 It replaces "Google Photos Desktop Uploader" and "Google Drive Desktop Sync." Please ignore the click bait headlines that created fears in our customer base that "Google Drive" was going to be shut down. Backup and Sync is the replacement and is an awesome upgrade of the legacy Desktop Sync utility. As of May 2017 Google Drive had over 800 million daily active users and hosts over 2 trillion files. That's a massive growth curve from 120 million active users in 2013. Google Drive with its lower storage costs and included suite of software is a huge long term threat to popular file sharing solutions like Dropbox and Box.Net. Google positions Backup and Sync as being for Personal users and Drive File Stream for Business users but using the two in combination has some big benefits that we'll dive into later. Backup and sync is their consumer sync client but G Suite organizations can use it too. Drive File Stream lets you see all your files in Google Drive without using storage space on your computer. It behaves much like a traditional mapped network drive letter in Windows File Explorer or a Network Share in Finder on a Mac. It's a key improvement that is allowing our customer base to ditch Windows File Shares for good. Files are streamed to your PC from the cloud on demand for use in your favourite desktop apps. Drive File Stream includes the ability to save specific files and folders offline, including Team Drives so you can still be productive offline without installing Backup and Sync. It's simple to open files like PDF's from Adobe Acrobat Pro and Microsoft Word directly from your Google Drive. Each time you press the Save button in your favourite app your changes are synced to Google Drive in the cloud. Version management is automatic so you can always roll back to a prior revision of your file. However, Drive File Stream does not upload your images to Google Photos nor can you tell it to automatically backup your Windows Document or desktop folder from your PC. You can read more about the differences between them here. On our next blog post we'll dive into installing Backup and Sync for G Suite organizations. In the mean time if you have any questions or would like pricing on Google Drive please contact us at Interlockit.com!